You call the book Travels with Mae, which puts your mother, Mae, at its center, but it seems to me that you are really the center of the book. I wonder what you learned about yourself in the writing of this book ­– or about your childhood or your life with your family – any moments where you suddenly had some realization? When she said, “This is what I want. I don’t want these other things” – I struggle with that, because I am also my father’s child. My father was much more likely to compromise and to go along with the program. “You say you want steak, you want pork chops? You want chicken? Whatever.” My mom would say, “Oh no, I want fried fish.” My dad would say, “Whatever.” So they were very different that way. Often I don’t want anything in particular. Sometimes I may know what I want. But often I don’t know what I want, and I don’t give myself a chance to find out – which is part of the reason why I so often get involved in other people’s problems, because I’m kind of a free-floating electron or neutron or whatever – I’m easily hooked up to somebody else’s program. What was the story about you going shopping for a house? That was her metaphor, and it was only when the readers’ reports came back, and I looked at the story about my mother that I had ended in a kind of abrupt way, not very fleshed out, that I said, “Oh my god, this hooks up to my mother’s story.” That was one instance of a theme – I see how my mother knew that she wanted something and she wasn’t willing to settle for less – or at least she would really try to get it. Did Travels with Mae start as an idea for a book or did it start in some other way? When my mother died, I felt that I wanted to leave something about her, and that was in 1997, but before that, I had written little things. I had a diary, which I’ve been keeping since 1985, and there were elements in that there were good for this. And once when she came to visit me in 1977, there was a little thing that happened when she was leaving. I thought it was a story, so I tried to write it. I wrote it in the third person. It was very stilted. I showed it to one of my colleagues at Williams College, the dean, and he didn’t really give me very good feedback on it, but years later when I came to do this book ultimately, when I knew I was doing a book, I went back to that story and I changed it, I put it back in the first person, and then it worked. I had also written, some seven or eight years after that first writing, just a little thing about how I felt when I was cooking with a friend in the kitchen, but there was no thought of a book then. In fact, maybe the first inkling was – well, when my mother died, I thought, it would be good to leave something about her. Then Kalidou did a painting, and I loved that painting. When I saw it I said, “That’s the cover of my book.” And then it became something. So Kalidou did a painting and it confirmed to me that yes, I was doing a book. So it took me a long time to know that it was going to be a book. It didn’t start off that way. The other thing that contributed was that Kalidou was in Senegal for several months because we have a little house there, and he was staying to make sure the work on the house advanced. So I was alone in Maryland for those months, and I would come home, and it was very comforting to come home and write about things, so that’s what I did. I had looked through my journal, and I realized that that first little piece from Williamstown and the piece about cooking had a lot of potential to me, and I looked through my journal to see what else there was. And I put all of that together, and it was maybe 60 pages. It wasn’t enough. So I said, well, let me think, maybe there’s something else I could write. That’s the period when I was in Maryland. That was 2002. And I set about writing some things that had happened, purposely, for the book. But still it wasn’t enough. And you were the one who said, “You need more,” and Gwendolyn [Midlo Hall, historian] said, “You need more, and by the way, where’s your dad? He’s not in here at all,” and you said, “I think you should put some of his letters in,” so I had you and Gwen pushing me to do more. Don’t you wish that your mother could have read your book? Why can’t we write the books about our mothers while they’re still alive? The fact is I would never have written it if she were still alive because first of all she wouldn’t have wanted me to write it because she would have felt that it exposes her too much, and it exposes my dad. I felt very uneasy about that, actually. I felt like – you know, they probably wouldn’t want people to know how much they fought. They probably wouldn’t want people to know about all their issues about boundaries, and some of the family stuff. But then I thought, you know they’re not here, and it really is a very loving book. It is a loving book. There’s love from them, love from you, love for your friends, your relationships with men. Did you have to work at opening yourself up so you could write in this way? It’s not that you talk a lot about the love. It just is there in the stories that you tell. Did you have to work at that? Maybe I didn’t because I was used to writing in my journal. I wrote in my journal, and I basically wrote – I don’t know who I was writing to, but I didn’t censor myself really, although at the very end there was one chapter – well, first of all I changed some names because I thought I don’t want to expose people who were still alive and well and might not like this. I didn’t say who my dad’s lover was, and things like that. But I did in one moment – I protected my mother. She did one thing that I never understood, I wish I’d asked her about it. But I have to tell you, in hindsight now, when I look at her attitude, I really see that she was right about those people, even though it wasn’t obvious to begin with, she was right, I’ve seen it, it’s been proven to me in the worst way. There’s a thread in the book, a small thread really about segregation – it comes up just a few times when you are very young and you get on a bus and you want to sit down near the front and your mother says “No, no, we’ll go in the back, and I’ll explain it some day.” And then when you go north and that’s a whole different world. But on the whole that’s not a dominant note in the book. 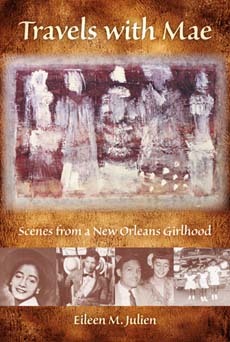 The book is really about the richness of your life in New Orleans and your family life. Do you feel like you left anything out in the area of racial bitterness? I left out all sorts of things. Afterwards it hit me – I never wrote about that incident where my father got picked up by the police for nothing. I never wrote about that. That was one thing I was sorry I had left out. Travels with Mae is made up of vignettes. How did you put them together? Did you spread them out on the floor? How did you decide which order to put them in, because they move around in time? And I like that part of it because I don’t feel it’s an A to B to C kind of book, because it all lives inside me at once, and it doesn’t matter in some sense about the order except I try to make it not too difficult for a reader to follow. But the problem really posed itself when I came to where to place the Kalidou story, and that I had to think about. Mostly I didn’t think a lot about it. Yes, it was intuitive. I knew what the first one was, and I knew what the last one was. And I knew that I wanted the real childhood ones to be more or less early, and then the others could be scrambled, so it wasn’t really an issue. Mostly it wasn’t hard, it just kind of fell into place. When did you have the idea of using photographs? Was it always there as soon as you began to think of it as a book? It wasn’t originally, although as I said, Kalidou’s painting made me think, “I am going to do this book.” I knew that Kalidou’s painting would be on the cover. And then I thought, “But wait”– ‘cause Kalidou died before it was out – and I said, “I want him to be in it too.” I wanted it to show the bonsai that he gave to my mom – that little water color he did. And the real Kalidou Sy painting, which is the one called Yunus in Wolof, which is a kind of Venus figure, because when I think of Kalidou and his work, the Indiana clay in these very African paintings and I think of my mother as gone, as dead, I think of her in terms of the earth and the body, and the clay, and I wanted that one, because I thought, this is what she is now, she’s clay, she’s earth. And I loved the paintings of the figures of the women. So I knew Kalidou’s would be there. But then I thought – “but wait, I have my friend Gilbert Fletcher from New Orleans, who has these great paintings,” so his is the frontispiece – that house on Burgundy. I wanted a picture of a New Orleans house. And Michael, whose mother is from New Orleans, who came there a lot as a kid. He had these prints that I thought would be very rich. One of them is a photo imposed on a house, a structure, and that woman is from southern Louisiana, and in fact is some sort of distant relative of mine. You still spend a lot of time in New Orleans and have the house that was your parents’ house that you grew up in. What about the response in New Orleans? Well, I tell you the College Arts and Humanities Institute didn’t want to sponsor my reading because it wasn’t academic, and I think they felt that they had to be very academic and that it was not a proper book for Institute sponsorship. Yes, but my immediate colleagues, my colleagues in Comp Lit, in French, in African- American Studies, they loved it, the students loved it. Then one of my colleagues gave me a little dinner. There are so many things in this book – little hints of these lives that you’ve lived in France and Senegal and Williamstown and Maryland, Bloomington. The rest of your life is really fascinating. Do you have any idea of writing more memoirs? I don’t know. Sometimes I think I do. There was one story about Kalidou I really wish I had told. Kalidou died during the writing of this book. He died before it was finished. And he didn’t play a big part. He had little bits, sort of cameos. Somebody said, “You know there’s not a whole lot of Kalidou,” and one morning, just as the book was about to go to press, I woke up and I said, “You know what, I’m going to do this. I’m going to do one real vignette on just Kalidou.” And I called the editor and said, “Can I just do one more?” And she said, “If it’s five or seven or three pages, but it can’t be an even number of pages.” So I did it. I felt that people would want to know more about him. And there was one story about him I didn’t tell. One night in Dakar – this was before ATM machines so you had to cash travelers’ checks, and I’d cashed travelers’ checks the week before but I’d run out, and he didn’t have any money. Most people in Dakar don’t go around with money. They get by on very little. So he didn’t have any money and my money had run out, and we’d gone to some place, a beach or – to have a drink. And we’d come back, and we were going to have grilled fish, and we needed a lemon to go with the fish. So we got close to the house, and across the street from the house there was this little greasy spoon, and we sometimes went in that place, and Kalidou went in there a lot. And all those women who worked in that little greasy spoon knew Kalidou. They loved him. In fact people loved him everywhere. And so we get close to the house. He says, “Go on up. I’m coming.” He walked into that little greasy spoon. Two minutes later he comes out with three lemons. It was amazing. Afterwards I thought about my own reaction. My reaction was you buy things that you want. You buy them – with money. That’s a person who’s been raised in a very capitalist way of thinking. It hadn’t occurred to me that you could go up to somebody and ask them for a lemon. If they knew you and liked you they’d give it to you. It was a revelation to me – my own thinking about how to solve a problem was limited by the way I had been taught to think about exchange. And Kalidou hadn’t been raised in that. He had what anthropologists call “wealth in people.” I didn’t put that in and later I was sorry. That’s a whole other book – your life with Kalidou. Use the contact form below to write to Carol Polsgrove or Eileen Julien.